With its collision of Berber, Islamic and French cultures, the mesmerising North African city of Marrakech has inspired artists, designers and musicians for centuries, as Eddie Hart discovers. The North African heat hits like a wall as I step out of the airport. A grey-bearded man wearing a knitted kufi (Islamic prayer cap) ushers me towards a washed-out yellow taxi, a vintage Mercedes-Benz. The driver asks where I am headed in French, thick with an unfamiliar accent. “Riad Jardin Secret, s’il vous plait,” I respond, melting into the seat. Arabic music blares from the crackling radio and the scent of diesel permeates the air. I lean out the window and the hot air blows my hair back as motorcyclists speed past in their billowing djellabas (traditional robes). “There are certain places on the surface of the earth that possess more magic than others, and one of those places is Marrakech,” said Paul Bowles, an American writer who resided in Morocco for more than half a century. I’m only here for a couple of days but I intend to discover the allure that has long enchanted foreign writers and artists. 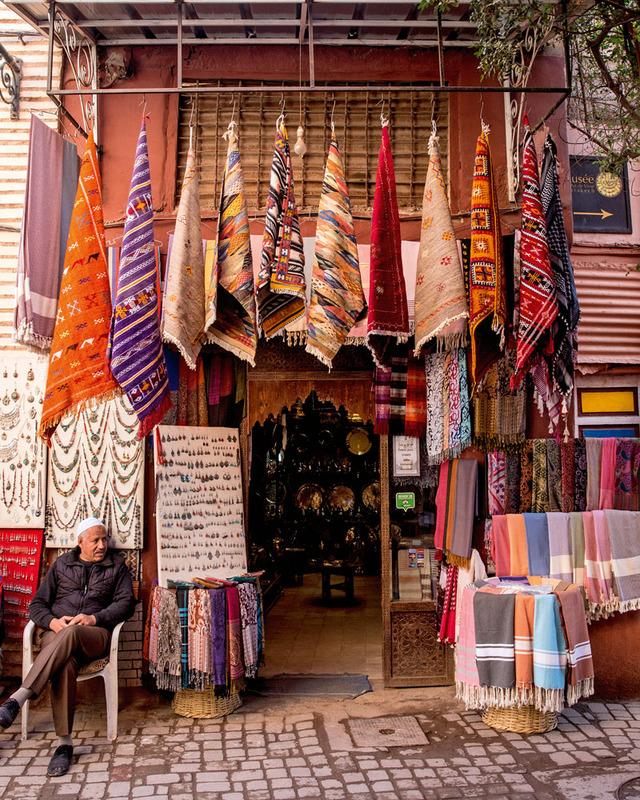 With its peeling paint, cobbled streets, exposed brick and myriad archways in every shape and colour, stepping into Marrakech’s medina is like stepping back in time. Once a caravan town along sub-Saharan trading routes snaking north from Timbuktu, the Ochre City has a history stretching back nearly a thousand years. The Almoravid dynasty founded the city in 1062, when the region served as a Berber gateway to the Sahara Desert. Salmon-pink rammed earth was crafted into a mosque, fortified citadel, ramparts and the monumental gates that laid the foundation for modern Marrakech, one of the great cities of the Maghreb. Wide, tangerine tree-lined boulevards, cafes and Art Deco buildings create a backdrop for Marrakech’s Ville Nouvelle (New Town). We cruise through the Gueliz neighbourhood, built during the French protectorate of the mid-twentieth century, rolling toward the medieval-plan medina for which the city is famed. Bustling, ramshackle streets replace orderly avenues and soon the taxi can go no further. I’m left to delve into the maze-like lanes on foot. Before I have time to get my bearings, my luggage has been hauled onto a rickety wheelbarrow by a group of young boys. Seeing my alarm they assure me, “It’s okay, we’ll take you to Riad Jardin Secret”. I pursue, weaving and winding into the disorientating tangle of alleyways. It’s a relief to finally stop before the heavy door of the riad (traditional house). One of the boys stands on his toes and raps the brass doorknock. The housekeeper, Youssef, creaks it open. He’s tall with startling green eyes and there’s something solemn and almost mystical about him; he seems to float in his robes. Handing over my suitcase, the boys’ expressions harden. “500 dirham,” they demand. Youssef points in the direction of a familiar looking gate at the end of the derb (alleyway) where the taxi had originally pulled up, silently revealing the scenic-route scam. An emerald green-tiled fountain laced with fairy lights bubbles in the middle of a courtyard overrun with towering palms. Riad Jardin Secret is a haven complete with palatial interiors – bright yellow tadelakt (plastered) walls, stucco arches, stained glass windows and filigreed balustrades. Unlike the medina just beyond the walls, there’s silence, except for the burbling fountain and teeny, chirping birds. Youssef presents me with a silver pot of mint tea and a near-toothless smile. For the uninitiated, Berber whiskey, as the brew is sometimes called, is the cornerstone of Moroccan hospitality. I sink into the lounge and sip on the infusion of green tea and fragrant spearmint leaves, sweetened with lumps of sugar while a curious kitten paws the tasselled pillows beside me. The property is one of hundreds of riads – centuries-old Moroccan mansions, typically with an interior courtyard and a sun-soaked rooftop terrace. These splendid guesthouses are inherently romantic, concealed behind ornate doors and set in the earthy walls of the medina. Revived by the liquid sugar, I venture back into the thrum of Marrakech. 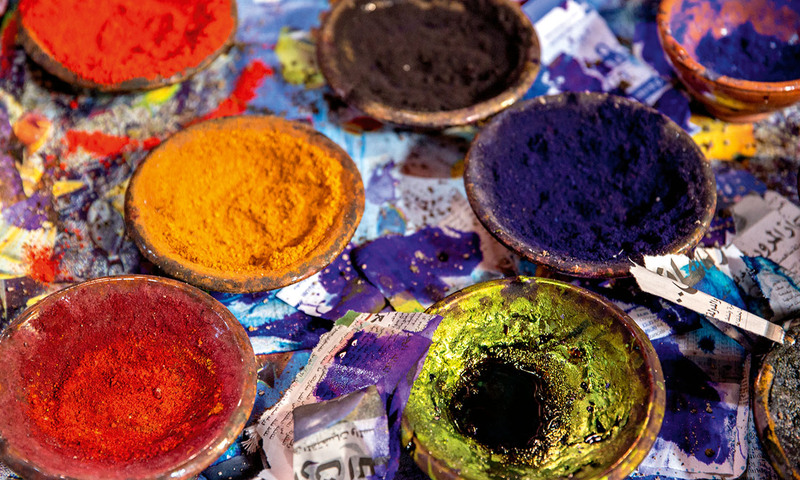 The souks, scarcely changed in centuries, are deeply rooted in the city’s rich heritage. A treasure trove of shopfronts lines the jumble of passages, and golden light pierces through the thatched-roof of the marketplace. The main artery is Souk Semmarine – a market piled floor-to-ceiling with pottery, fabrics, carpets, antiques and pastry shops laden with honey-slathered Arabic treats so syrupy they buzz with bumblebees. Craftsmen ply their trade across town. I’m drawn by the clanging chorus of iron hammers towards the blacksmith’s quarter. I meander through lanes lined with butter-soft leather and handcrafted rugs. I stoop between the skeins of richly dyed wool hanging in the dyers’ souk in shades of burnt orange, saffron yellow and poppy red. I trail the heady path towards the spice square, where the scents of amber, musk and orange blossom linger in the air. It’s here that I step inside a herboriste (apothecary), drawn in by the display of jars filled with all things weird and wonderful. “Come in!” calls a man in a white lab coat, swooping out from behind a counter. He pushes a googly-eyed reptile in my direction, seemingly plucked out of the air by sorcery. “Would you like to see the chameleon change colour?” he asks. I shake my head. He shifts tack. “I see that you have a cold,” he notes, reaching up to pull a jar containing shards of white crystals off the shelf. He removes the lid, gesturing for me to inhale. A cool sharpness invades my nose clearing my airways. Before I know it, I’ve parted with a few dirhams for a small pouch of eucalyptus crystals. When he offers to concoct a potion to improve my love life, it’s time to go. Scooters, donkeys, bicycles – any mode of transport goes in the souks of the Ochre City. Leaving the souks behind I make for the nineteenth-century Bahia Palace – a kaleidoscope of cobalt, saffron yellow and peacock blue – which, at the height of its excess, housed a harem. For a glimpse into the world of Saadian sultans, who ruled the country in the sixteenth and seventeenth centuries, I seek out the El Badi Palace where storks have constructed colossal nests in the remnants of the rammed-earth walls. An impressive marble mausoleum, the Saadian Tombs, is a stone’s throw away. I flop down in a booth at Café Clock – a laid-back cultural hub a little off the beaten track in the Kasbah district. It’s decked out with eclectic furnishings and walls that flaunt bright pops of artwork. I’ve missed one of their regular hikayat (traditional storytelling) sessions but feel appeased after sampling the legendary camel burger and a creamy date milkshake. To escape the intense heat I jump in a taxi uptown to find sanctuary under the shady palms of Jardin Majorelle. Beyond the electric blue facade and Art Deco residence are grounds bursting with bright bougainvillea and sky-scraping cacti. French painter Jacques Majorelle spent 40 years creating this dreamy setting, which was later acquired by Yves Saint Laurent. The fashion designer found the botanical oasis and the wider city a source of inspiration. He is often quoted as saying, “Marrakech was a great shock to me. This city taught me colour”. The courtyard at Riad Jardin Secret bristles with greenery. In the evening I find myself dining at an expat hangout with bohemian babes and artistic types I’d met earlier in the galleries of Gueliz. We mingle on the balcony of Nomad, with sweeping views over the city. Palm trees and minarets punctuate the cloudless sky and the snow-capped Atlas Mountains fringe the horizon. I tuck into my tagine studded with apricots and dates, mounds of pillowy-soft couscous and flaky pigeon pastilla (Moroccan spiced pie). Wicker lanterns strung up along the terrace glow in the dimming light and the medina transforms under the cloak of moonlight. When the shutters close for the evening the souks are unrecognisable. The darkened alleyways are empty, save for a stray cat or the glimpse of a cloaked figure disappearing into the shadows. I’m slightly relieved, yet again, when Youssef swings open the riad door. The next day begins with a typical breakfast served on the rooftop. Freshly baked bread accompanies baghrir (semolina pancakes), homemade jam, yoghurt and seasonal fruits, which I can’t quite do justice as I’m off to a half-day cooking class at La Maison Arabe. The historic riad was the first to open a restaurant for foreigners, entertaining the likes of Winston Churchill, Charles de Gaulle and Jackie Kennedy. Moroccan cuisine is a melting pot of Berber, Jewish and Iberian influences and I set to task, learning how to whip up a traditional, slow-cooked, chicken tagine. Lifting the lid of the earthenware pot releases a billow of steam, tangy with preserved lemons and olives, revealing a richly spiced stew. After class I head for La Maison de la Photographie, a gallery in a former fondouk (merchant warehouse) showing an incredible collection of vintage Moroccan photography. I continue onwards to Ben Youssef Medersa, once the largest Qur’anic school in North Africa and still the most splendid. Meet the locals in the narrow backstreets of Marrakech. As I step outside the threshold a young man approaches me to suggest I visit the tannery. “It’s the Festival of Colour today,” he coaxes. Despite the fact there is no such festival, as I soon discover, it’s worth clambering up the terrace to look out over the sea of dye-filled vats and soaking skins. A worker hands me a posy of mint to mask the acrid odour of pigeon excrement used in the age-old tanning process. The afternoon shadows grow longer and I realise it’s my last chance to watch the sunset over Djemaa el-Fna. I slip back into the warren, hastening my pace. Following the beat of Gnawa drums towards the dizzyingly chaotic pulse of Marrakech, I crash in the carnival-esque main square of the market. At dusk, there are over a hundred makeshift food stalls blanketing the square. Street-side vendors sell delicacies from fragrant grilled meats to camel spleen, broiled sheep’s head and snails in saffron broth. The smoke billowing from the grill stings my eyes as I slip past the touts beckoning me to their booths, the soothsayers, snake charmers, magicians, henna tattoo artists and the blaze of fire-eaters. I sidestep the circus of cobras transfixed by the pipe, mischievous monkeys and wild-eyed horses pulling gypsy carriages. I narrowly avoid colliding with a man performing a rudimentary tooth extraction, as I dive between the drumbeat dancers and airborne acrobats. I race up the stairs of Le Grand Balcon du Café Glacier. Doubled over and breathless, I manage to order a pot of mint tea and slide into a seat overlooking the open-air theatre. I’m just in time for the performance – streaks of orange, cerise and indigo paint the sky. The shimmering gas lamps from the stalls illuminate the square and a muezzin’s call to prayer echoes across the warm night from a mosque. That’s when I find it – an inescapable magic among all the madness. Qatar Airways flies from Sydney to Marrakech via Doha and Casablanca from AU$1500 return. Riad Jardin Secret is an authentic riad in the heart of Marrakech’s medina. A standard double room starts at around AU$200 per night, breakfast included. Australians can stay in Morocco without a visa for less than three months, but it’s advisable to get your passport stamped upon entry. For more information on Marrakech and Morocco, visit the official tourism site. The classes at La Maison Arabe are conducted by a dada (traditional Moroccan cook). 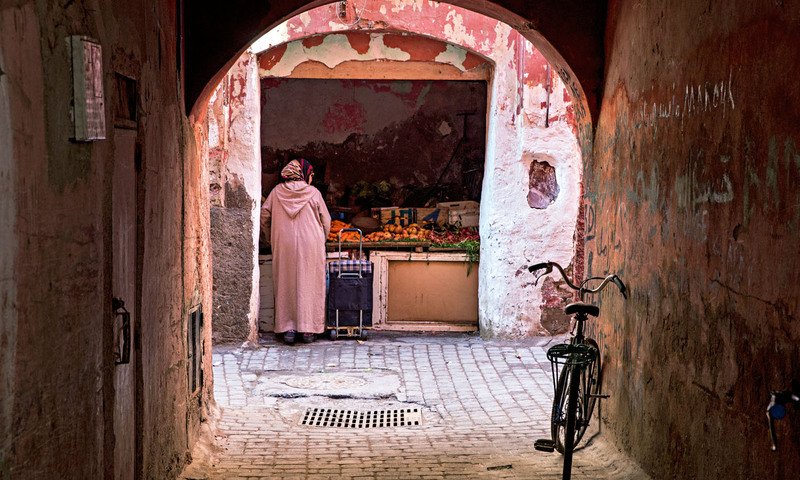 A half-day workshop typically includes an overview of Moroccan cuisine, a mint tea demonstration, a trip to a local bakery and time to learn how to cook an appetiser and main dish. It costs around AU$80 per person for the three-hour, small-group workshop, including a three-course lunch.